Following the success of last year’s Bacon Festival, the Cuckoo Callay Cafe has rolled out a new, limited-time-only, bacon-themed menu for 2016! (You may remember my previous post featuring last year’s Bacon Festival; it’s here.) This time they’ve turned up the decadence factor, throwing in extra layers of flavor and texture– and some unexpected fruity components. Here are some of the lineup’s big stars! Starting off with a tried-and-true classic, the standard breakfast of eggs and toast is made heartier with the addition of thick-cut maple bacon. 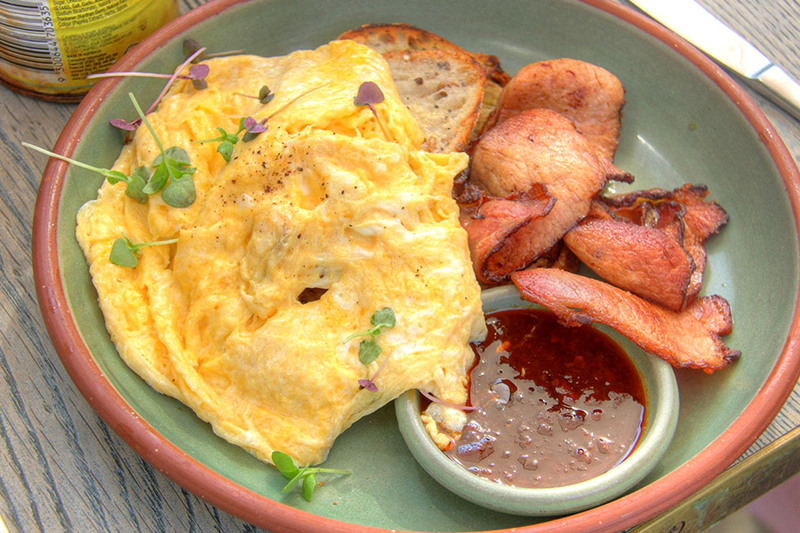 The omelette is soft and light, which complements the crisp and crusty sourdough toast. The bacon in this particular dish is all tender, not crunchy, but it’s pleasantly juicy and packs a lot of smoky maple flavor. Topped off with the superbly zesty, not-too-sweet beetroot relish, this dish is a wonderful start (or middle, or end!) to any day. Love carrot cake? Love waffles? And bacon? You’ll totally dig this dessert, then. The waffle is carrot cake-flavored: thicker and softer than a regular waffle, and filled with finely shredded carrots, chopped walnuts, and the lovely scent of nutmeg. 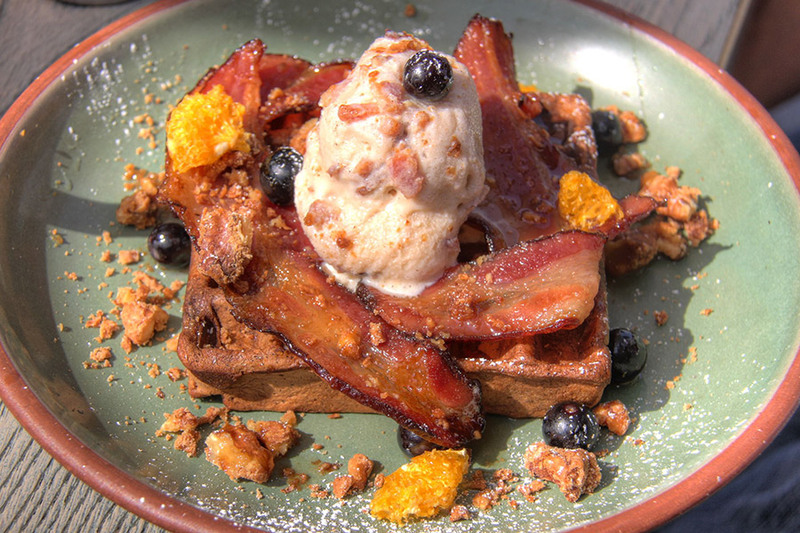 It’s topped with house-made bacon and cinnamon ice cream, and lavished with strips of candied maple bacon, walnut praline, fresh blueberries, freeze-dried mandarin orange pieces, and extra bits of crunchy bacon. The maple bacon strips are almost soft and yielding, perfect for a dessert. The blueberries add a burst of juicy sweet-tartness, and the freeze-dried mandarin pieces are so chewy and full of wonderful, zingy orange flavor that they’re almost like little candies. Try to include at least one small piece of sugary, crunchy caramelized walnut praline in each mouthful– it tops off the various tastes so beautifully. My only issue with this dish is a minor one: the bacon and cinnamon ice cream hits all the right notes in terms of taste, but it’s just a bit too icy and slushy for my liking. It could use some extra creaminess. A cute name for a chic little dish: a “box” made of maple bacon strips and pork sausage, enclosing a soft Camembert cheese filling. It’s topped by a delicately poached egg with herbs and black pepper, and surrounded by roasted baby tomatoes, beetroot chutney, and spinach puree. The sweet-salty bacon and wonderfully savory, juicy pork sausage are both tender and easy to slice with a fork. The Camembert filling is absolute gooey indulgence; its subtle creaminess and fragrant notes, along with the rich, flowing yolk of the poached egg, are the ideal partner to the more strongly flavored elements. The spinach puree is exceedingly silky-smooth, and surprisingly punchy; the subtle flavor of spinach is there, but almost as zesty and sweet as the beetroot chutney beside it. The tomatoes are a refreshing touch, roasted until their skins are masterfully seared and tender but not charred and tough. Don’t be fooled by this dessert’s appearance– this really is a cinnamon doughnut, split through the middle like a burger. 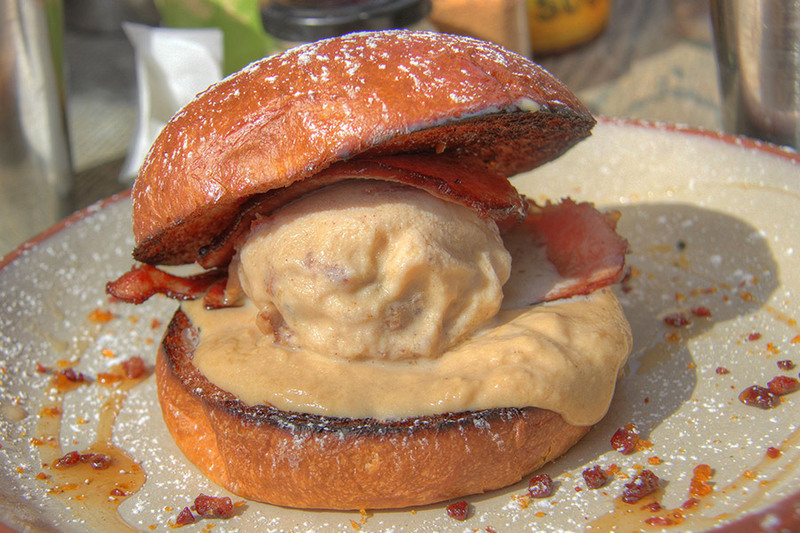 It’s filled with the same bacon and cinnamon ice cream as My Sweet ValenSwine, along with strips of candied maple bacon and a dollop of peanut butter mousse. Dotted around the plate are bits of crunchy bacon praline and swirls of runny caramel sauce. The tastes in this dish work splendidly together, but I’m not entirely wowed by the textures. The ice cream, like the kind in My Sweet ValenSwine, is too slushy and icy. The peanut butter mousse– although it has the right balance of saltiness and sweetness, and tastes gloriously of peanuts through and through– is too runny to be termed a mousse. The bacon is neither satisfyingly chewy, nor addictively crunchy– it’s at an awkward in-between stage, but its smoky-yet-mellow maple flavor is magnificent. The elements with well executed textures are the soft and light doughnut, and the delectably crispy bacon praline bits. The doughnut contains just the slightest tinge of cinnamon, which is quite fine with me but may be disappointing who prefer a bigger cinnamon hit. 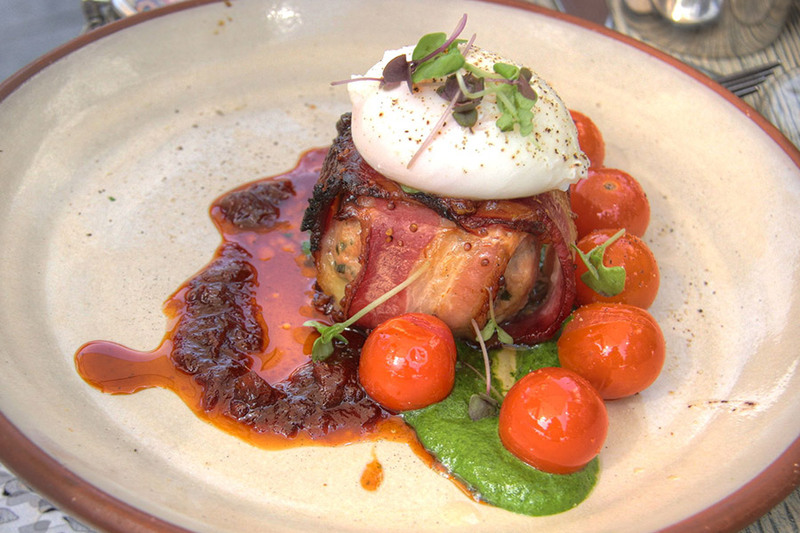 There’s more to the Bacon Festival than what’s covered here– to check it out for yourself, visit the Cuckoo Callay at Newtown train station. 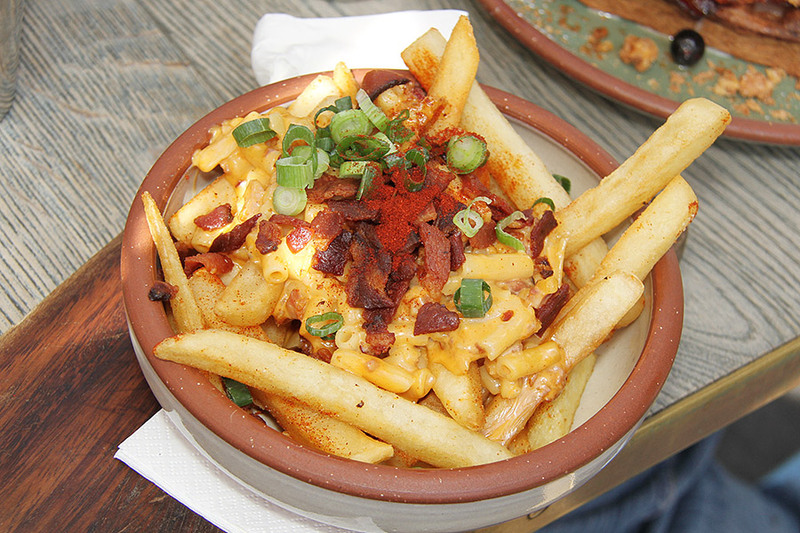 You can view their full menu (including their non-bacon themed items) and opening hours at their website: http://www.cuckoo-callay.com.au/.